Jim Stults, Harold Bennet Linville, Rayburn Linville, Betty Ruth Butler Burdine, Iva Nell Linville, Billy Balentine, Billy Stults, Christine Linville, Aquilla Phillips Chambers, Stella Glass, Frances Lou Linville, brother Ed Crosslin (may have been pastor at this time), Mrs. Ed Crosslin, Imogene Phillips McFall, Erma Ruth Balentine Butler, Jewel Dean Linville Butler, Evelyn Linville Campbell, John Thomas Balentine, Ruth Linville O’Bryant, Gertrude Norred, brother Theodore Norred, Jimmy Linville, Leo Hunt, brother Ellis Rowden, Louise Butler, Marple Chambers, Oscar Chambers, Virgie Balentine, Bobby Joe Stults, Oma Linville, Sam Linville, Tina Mae Bradley Linville, Bessie Dee Burns Butler, brother R.T. Berry, Maudie Berry, Margaret Berry, Era Phillips and Francis Irajene Linville Mason. Originally, State Line Missionary Baptist Church was built on a one acre parcel beginning in 1943. On November 3, 1945, Carl Wesley Phillips, wife Ada P. Phillips and R.L. Brown conveyed ownership of the property to church trustees, Sam Linville, Ed Crosslin and R.H. Stults. It is thought that Ed Crosslin was pastor from about 1943 to 1945 or 1946. Various preachers filled the pulpit in the early years. A brother Rains filled in as preacher at some point in time. Brother Leland Horton preached for about four years. Brother Ernest Roberson was pastor until 1987 or 1988. Randy D. Nelson was pastor from approximately 1988-1992. In 1992, Jacky Ward began as pastor and served until 2008. In March or April of 2008, brother Keith Montgomery was called as interim pastor and accepted full responsibilities in November of 2008 and continues today. The first church building ( see Photo Gallery) was destroyed by fire in about 1976. The preacher at the time was brother Leon Bates. After this time, Green River Baptist church in Waynesboro, Tennessee, sent help with the cost of constructing a new building. 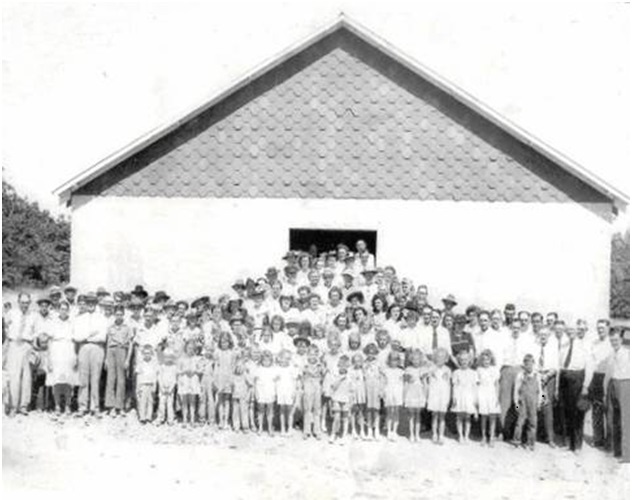 By October 1977, a new church building was completed at a cost of about $10,000.00, with most labor donated. As the need arose, a new building was constructed in 1997 with an approximate seating capacity of 350. Ten years later, the church celebrated with a note burning as the church was debt free.